British actress Julie Walters has been named the most powerful figure in TV drama in a magazine poll. A group of industry experts voted her "top of the pile" in a top 40 compiled by the Radio Times. 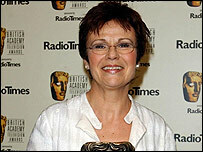 Walters won her third consecutive Bafta this year for The Wife of Bath, a BBC adaptation of Chaucer's classic tale. Jane Tranter, controller of BBC drama commissioning was placed second. David Jason, James Nesbitt and Caroline Quentin also featured in the top 10. The Radio Times praised Walters for her diverse career. "Her track record of success across different channels is all the more remarkable for being combined with a buoyant film career, which guarantees her position as an above-the-title name who can deliver critical acclaim and ratings success," the magazine said. Ms Tranter said Walters had universal appeal. "Apart from her extraordinary skill and craft, she has the ability to represent all of us, no matter what the age, class or situation of her role." Walters also won the best actress Bafta for TV drama Murder in 2003, and My Beautiful Son in 2002. Actor David Jason, star of dramas such as A Touch of Frost and The Quest, was third in the poll. Paul Abbot, the creator of TV's State of Play, Clocking Off and Shameless, was the only writer in the top 10. The new Doctor Who, Christopher Eccleston, was voted into 19th place in the poll. The Radio Times canvassed actors, directors, writers, producers and agents for the poll. No soap actors appeared in the top 40. "We've taken the view that any actor in a soap derives their power from the programme until they prove themselves elsewhere," the magazine said. "The actors who make this list reflect the considerable depth of talent that exists in this country... encouragingly, appearing in a soap and drinking at London's Met Bar doesn't seem to matter quite as much as it once did."